Balt 27694 Trend teacher's mobile podium adds style and elegance to any speaking environment with its vacuum formed PVC surface and cherry woodgrain finish. The angled top includes a convenient paper stop, has a height adjustment range of 6", and locks into place for reliable use. Grommets in the podium body provide easy cable management. Sturdy powder-coat steel frame. Four 3" swivel casters, 2 locking for smooth mobility. 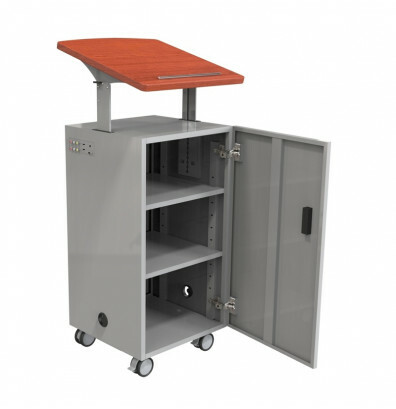 The 27694 Trend podium features ample storage ability. Designed with a cabinet that includes two adjustable shelves. The cabinet locks for added security and comes with two keys. 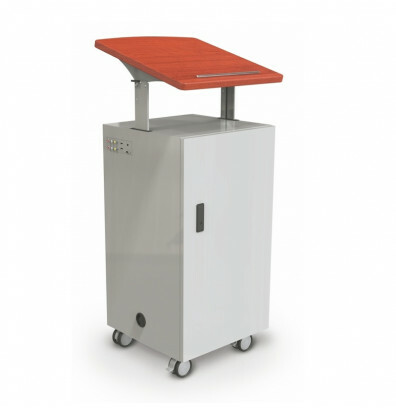 This Balt teacher's mobile podium is also available with a desk (Balt 27692). An optional accessory includes an AV panel (Balt 66656).